In the PR agency world, after weeks of fine-tuning messaging, crafting stories and pitching reporters, there’s no better feeling than landing a top media interview for a client. It signals that the overall public relations strategy is on the right track. Most importantly, of course, a media interview will lead to positive coverage – assuming it goes well. Nailing the interview, however, isn’t always easy, especially when it comes to technology PR opportunities. Even with advance preparation, executives can fumble or leave opportunities on the table. With that in mind, here are eight seemingly small media interview mistakes every spokesperson should avoid, regardless of whether the interview is in person or over the phone. Here I’m not talking about live television segments, which obviously must happen on time and for which we routinely build in a generous cushion. But for any type of interview, being punctual conveys respect and sets the tone for the conversation. Still, I’ve seen several executives arrive more than a few minutes late to a media sit-down. It’s also easy to run a few minutes late for a phone interview, but that’s even worse, because a phoner is typically squeezed into the journalist’s daily schedule, and he may not have decided whether to do a story. Lateness can annoy the journalist, and in general, it pays to get as much time as possible with a key media contact. The more time, the better the chance of a story, particularly in situations where technical details must be highlighted. Every PR person has been on an interview where the client calls the reporter by the wrong name or confuses their publication with another one. It’s cringeworthy – and easily prevented. In advance of an interview, it’s critical for clients to read or even study the briefing materials their PR team has prepared. A briefing document includes basic information about a journalist as well as deeper insights on their point of view, relevant stories, and more. It ensures clients are prepared and don’t make unforced errors. Outside of a formal media training, every good PR agency team will take an experienced spokesperson through anticipated questions to prepare him for the conversation. It simply takes that extra time commitment. For some reason, many executives will tell a reporter that they’re seeing “lots of interest” from the media about a story, or that they’re “speaking to the media to get the story out.” Some will even name the outlets where they’ve had interviews. None of this is helpful. For any media interview, it’s important to treat the interviewer like they’re the only one in the world hearing that perspective. If they feel like the story is being covered by other outlets or that it’s being shopped around, they may choose to take a pass on the story. Ideally, an interview should be a back-and-forth, with participation from both sides. Sometimes a journalist’s interview style might be more passive. Yet it’s better for the executive to pause as he or she shares information, particularly when it comes to technology stories. This allows the journalist to absorb the spokesperson’s point of view and areas of expertise and interject questions. I sometimes recommend that the executive pause and ask the interviewer if what they’ve just outlined is clear. That way, they have more cues about how well the journalist if following the conversation and how compelling it is to him. This one may be controversial, but my clients will tell you that I frequently jump in during interviews. I’ll chime in to communicate a key message or theme, to clarify a point, or to share background. A media interview’s PR host – and every interview should have a PR host, if possible – should not necessarily be a passive participant during an interview. They should be looking for opportunities to support the client where appropriate. Too many PR pros simply “listen in” but fail to direct the conversation. In my view, that helps no one. This is another point where professional communicators can disagree, but I discourage direct contact between media and client spokespersons. By the end of an interview, a client may invite the interviewer to email them, but this is risky. It’s the PR team who should be the point of contact for any follow-ups. PR professionals serve several functions, but one of the most important is as “buffer” between client and journalist. If a journalist has a tough question, why should they be able to reach out to an executive directly? I see our role as ensuring that our client addresses the question appropriately, or can avoid it if that’s recommended. A media interview is an opportunity for a journalist to get substantive information to support a story. While it’s critical to weave in key themes and messages, speaking like a marketing robot that regurgitates jargon from a messaging document or website will turn off the interviewer. Clients should speak naturally and show their expertise about the topic at hand. This is easier for some than for others, but it’s always possible with advance preparation. At the end of every interview, the reporter will ask, “Is there anything else I should know?” While some view this as a formality, for the interviewee, it’s really an opportunity to summarize key points, take stock of what was said and to plug any gaps from the conversation. Too many clients will respond to the “is there anything else” question with, “Nope, that’s it.” Take 30 seconds to end the call as effectively as possible. 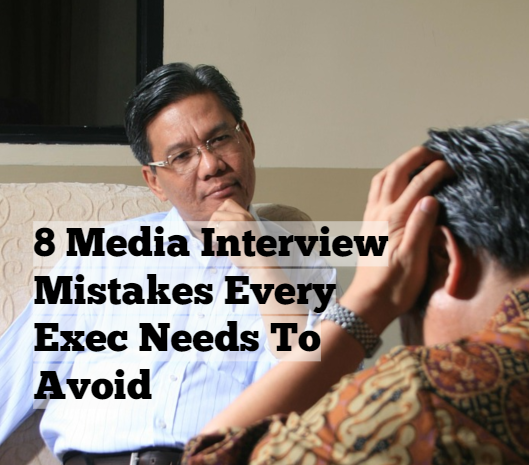 These are just a few common media interview missteps or lost opportunities we’ve seen. What are others interviewees should avoid? There’s a flipside to this line of thinking. I embrace tough questions from journalists and always push for my clients to answer them. Dodging inconvenient questions is a way to avoid short-term difficulties, yes, but there’s considerable long-term value in confronting them head-on with clear, consistent, and accurate responses. And the best journalists are the ones who constantly -have- those tough questions for sources in the first place. I want my clients to have resilient relationships with the best writers and editors out there, and that starts with giving them honest responses to real questions. I don’t want softball coverage.